FIGURE 1. BreadboArduino chaser lights. In Part 1 of this series, we looked at the software side of Digital I/O (DIO) as it is done in the Arduino using the sequentially numbered pins on the Arduino board. We wrote a library of functions like the Arduino DIO functions but used regular C concepts and tools (AVRStudio, WinAVR, avrdude, avrlibc, etc.). In Part 2, we saw that the Arduino pins are simple abstractions of the deeper AVR microcontroller’s concept of ports that are eight-bit arrays of pins, and then we wrote a library that specifically handles ports and their pins as they are used by raw AVRs. Now in Part 3, we will drop the abstractions and look at how DIO is really done in AVRs using the tools available in C, without having to write special libraries to manipulate the ports and pins for DIO. So, Part 1 was a high level abstraction for DIO; Part 2 was a mid-level abstraction; and in Part 3, we will look at the raw low level stuff with no abstractions involved. After we see how the professionals do this (yes, it will be on the test), we will (mercifully) build a set of low level macros that will help you do things with DIO without requiring that you be a certified C guru. [BTW, if you know what PORTB &= ~(1<<PB5); does immediately without having to think about it, then you are certifiable.] Since we are determined to get as close to the machine as possible, we will demonstrate the DIO input with an eight-pin DIP switch and the DIO output with eight LEDs using an ATmega328 on a breadboard (as shown in Figure 1). 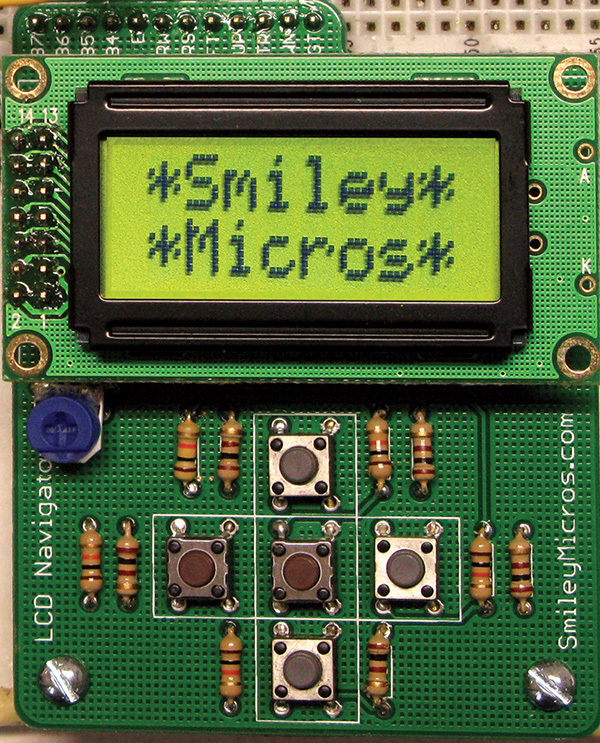 We looked at the BreadboArduino in Smiley’s Workshop 21 (See series sidebar at the right). The parts kit is available from Nuts & Volts. Bitwise operators are critically important in microcontroller software. They allow us to do many things in C that can be directly and efficiently translated into microcontroller machine operations. This is a dense topic, so get out a pencil and piece of paper and work through each of the examples until you understand it. In case you’ve ever wondered how to tell what is true and what is false, for bitwise operators which use binary logic (single bits), 1 is true and 0 is false. Now, memorize them. Ouch, but yes, I am serious. We see that bit 3 is 1 in 0x08 and 1 | 0 = 1, so we set bit 3 in myByte. This shows that only bit # 3 of myByte is changed by the OR operation. It is the only bit equal to 1 in 0x08 and ORing 1 with anything always yields 1, so you can use it to ‘set’ a bit regardless of that bit value. Now let’s do the same thing with the & operator. From this, you see that ANDing with 1 leaves the bit value the same as the original bit, and ANDing with 0 clears that bit regardless of its state, so you can use ANDing with 0 to ‘clear’ a bit value. Setting and clearing bits is very important in AVR microcontrollers since the plethora of peripherals available are set up by either setting or clearing the hundreds of bits in dozens of byte-sized registers. In each of the above cases, we are only dealing with a single bit, but we might be interested in any or all of the bits. Another important feature of using bitwise operators is that it allows us to set or clear a specific bit or group of bits in a byte without knowing the state of — nor affecting — the bits we aren’t interested in. For example, suppose we are only interested in bits 0, 2, and 6. Let’s set bit 6, regardless of its present value, then clear bits 0 and 2, also regardless of their present value and — here’s the trick — we must leave bits 1, 2, 4, 5, and 7 as they were when we began. So, in summary, we set bits with ‘|’ and clear bits with ‘&.’ If you are going ‘Oh my gawd!’ at this point, I hope it is because you are surprised that you actually understand this. If it isn’t, then get that pencil and paper, and go back till you do. XORing is used a lot in cryptographers, but not a lot by us mortals. The shift operators can be used to radically speed up multiplication and division IF you use numbers that are a power of 2. You might want to do this for tasks like averaging ADC readings. When we study ADC, you’ll see that sometimes we can get more accurate results if we take a bunch of readings and average them. My first inclination was to take 10 readings and then divide by 10. I chose 10 because I’ve got that many fingers, but if I had chosen eight or 16 then my division would be much faster using >>. If I divide by 10, the compiler has to call a large and complex division function and floating-point data types, but if I divide by eight it only needs to shift bits three positions to the right. Three quick right shift operations versus lots of time and program space — the tradeoff is precision. The low three bits (110) fall out of the AVR and have to be swept up later. [You didn’t believe that did you? They actually just disappear.] Anyway, the value now (ignoring the leading zeros) is 111010 which is decimal 58. Note that 58 is not 58.75, but you did save both time and program space so you have to decide which is better to use. The binary averaging gets you closer than all but two of the eight readings (59) and it does it lightning fast so if you are time constrained, the tradeoff should be obvious. A condition is any combination of variables, operators, and function calls that produce a single value. Since this is a logic condition, then any result of 0 is false and any other result is true. Since one of our goals is to learn C — which sometimes means learning several equivalent ways to do the same thing — you ought to get used to the ternary conditional operator because you will see it a lot, and we will use it in the digitalio library. I like to share my really dumb errors with folks so that they can see that even those of us who ought to know this stuff by now sometimes make embarrassing mistakes. So, what is wrong with the following? If we want to clear the 0 bit in PORTB, we write: PORTB &= ~(1<<PORTB0). I’m sorry, but this is just nasty looking. It is the C way of doing things, but listen up my friend because now I’m going to give you some truth. If you want to be a professional C programmer and get to wag your huge wagging thing that other pros wag, then you not only have to memorize the bitwise operators, you have to use them raw — and you must scoff at folks who use simplifying macros. However, if you are more interested in getting the job done than in wagging your C programming skills at people, then you might want to use a set of simplifying macros that encapsulate all those mind-bending operators into something with a descriptive name attached to them. Like maybe bit_clear(PORTB, PORTB0) instead of PORTB &= ~(1<<PORTB0. All that theory makes my head hurt! To help us feel better, let’s make something bright and shiny! And what is brighter and shinier than LEDs? (Okay, the sun, but who has time to go outdoors when there is so much neat stuff to learn?). 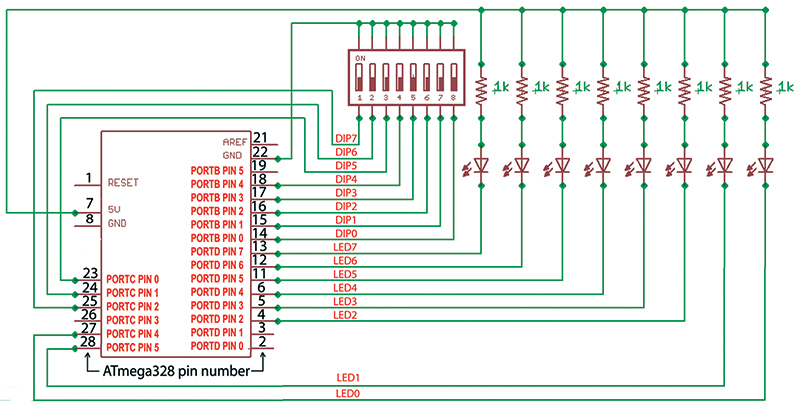 Let’s design some chaser lights with eight LEDs that allow us to use an eight-pin DIP switch to select 16 sweep patterns, eight speeds, and polarity (more on that later). You can see what this looks like in Figure 1, and I’m sorry for the rat’s nest of wires. 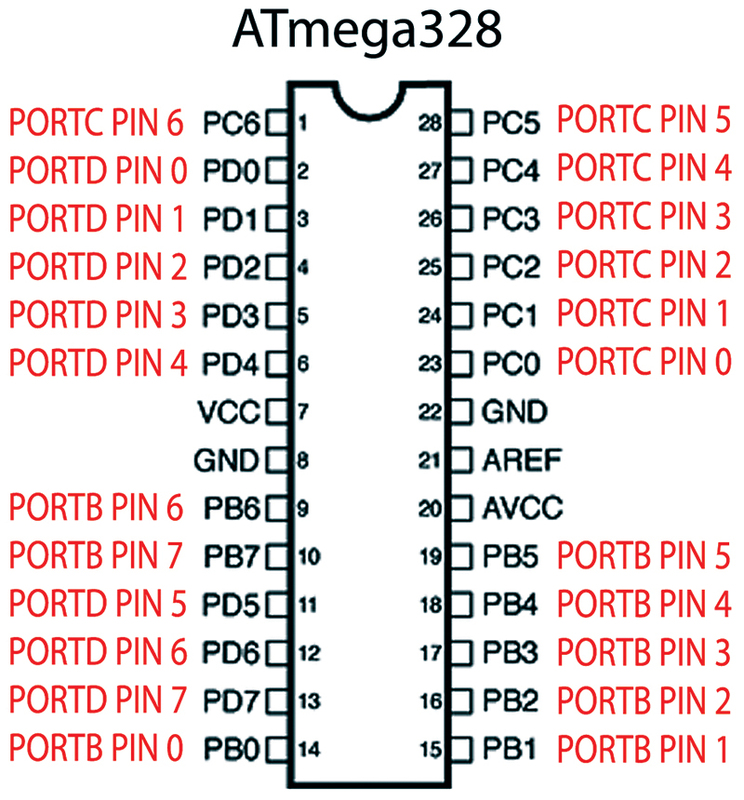 The ATmega328 pins in Figure 2 and the schematic in Figure 3 will guide you in creating your own rat’s nest. FIGURE 3. ATmega328 pins for DIP switch and LED. FIGURE 4. DIP switch use. This method allows the compiler to do some serious optimizing and according to another AVRFreak, Cliff Lawson, this wonder uses only four opcodes on an AVR! If there is a down side, it is that this may well be one of the most complicated looking things we have seen so far. But if you’ll take some time with it, you should be able to follow what it is doing. First, the bit_to_shift8 macro finds the number of 0 bits to the right of a mask. For instance, for our PATTERNMASK 0xF0 // 0b11110000 we see that after we mask the DIP switch we need to shift the value four places to the right to get the numeric value of the pattern field. As you remember from algebra, when you work a problem with parenthesis you evaluate the innermost one first, then sequentially each next inner parenthesis until you get to the final outer parenthesis. In the case of the bit_to_shif8 macro, the system first evaluates the expression: ((mask) & 0x40) ? 6 : 7 ). This looks at the second highest bit position and if it is 1, then the lowest bit found — so far — is the 0x40 bit, number 6; if not, then it is 7. Next, it looks at ((mask) & 0x20) ? 5 : ( X ). This looks at the third highest bit position and if it is 1, then the lowest bit found — so far — is the 0x20 bit, number 5; if not, then it is what we found in the previous evaluation (either bit 6 or 7). The next ((mask) & 0x10) ? 4 : ( \ does exactly the same as before and determines the lowest bit so far. This continues until each bit has been evaluated. For the PATTERNMASK, the lowest bit is 0x01 and the shift is 4. 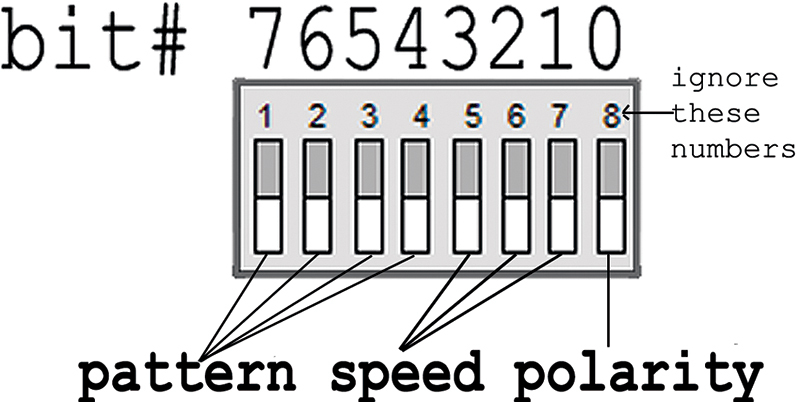 For the SPEEDMASK, the lowest bit it 0x02 and the shift is 1. For the POLARITYMASK, the lowest bit is the lowest bit 0, so the shift is also 0. So for our pattern mask, the bit_to_shift8 tells us how many bits to shift right. We just AND ‘&’ our DIP switch value with our PATTERNMASK and shift it the four bits to get the number for the pattern. I hope this is clear because if you understand it, you are getting fairly sophisticated in your understanding of C programming and bitwise operations. I also recommend rereading this section each night at bedtime if you have trouble falling to sleep (with this, you should find yourself nodding right off). Okay, I’ve slipped off the rails again and run out of time and space (fortunately, gravity is still working), so if you want to see how this is used in a real chaser light application, you can get the source code at http://code.google.com/p/avrtoolbox in the sources under avr_applications\simple-chaser_lights. FIGURE 5. Next episode’s LCD navigator.